Oregon had one coal-fired generating station in 2005, the Boardman Plant, with 601 MW of capacity - representing 4.7% of the state's total electric generating capacity. 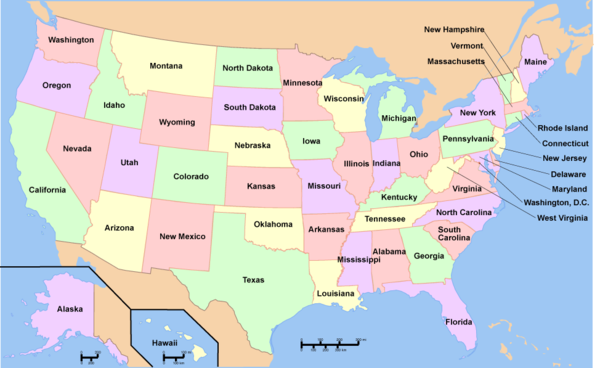 Oregon ranks 42nd out of the 50 states in terms of coal energy production. However, nearly 40% of Oregon's power comes from coal, half of which is produced out of state, primarily the Powder River Basin in Wyoming and Montana. In 2006, Oregon's sole coal-fired power plant produced 4.03 million tons of CO2, 9,000 tons of sulfur dioxide, and 5,000 tons of nitrogen oxide; this plant was responsible for 10.0% of the state's total CO2 emissions. In 2005, Oregon emitted 10.9 tons of CO2 per person, slightly more than half the U.S. average. This lower level of CO2 emissions is due largely to the fact that hydroelectric power makes up 64.6% of the state's generating capacity. No coal was mined in Oregon in 2006. In January 2010, Portland General Electric (PGE) announced plans to shut down the Boardman plant by 2020, twenty years earlier than expected. Under the current operation plan, PGE is required to invest more than a half billion dollars in pollution controls at the plant by 2017, to comply with federal and state clean air regulations and keep it running until 2040. Instead, PGE proposes to invest $45 million next year to partially clean up its emissions of mercury and oxides of nitrogen, and operate the plant until 2020. PGE's first plan to close Boardman was rejected by the Oregon Department of Environmental of Quality in June 2010, requiring PGE to develop an alternative plan. Oregon Department of Environmental Quality stated that it was not opposed to an early closure, but only wanted to do so in the most effective way possible. Oregon has virtually no coal reserves and there is no history of coal mining in the state. The state's only coal-fired power plant, Boardman, was built in 1980. The Lower Columbia Clean Energy Center, which would have almost doubled Oregon's coal power generating capacity, was abandoned in the summer of 2008. The Boardman Plant, has increasingly come under scrutiny from Oregonians and local environmental groups. The Sierra Club, Friends of Columbia Gorge and others sued PGE in September of 2009, arguing that the power company had violated clean air regulations and in October a federal judge dismissed Portland General Electric's (PGE) motion to dismiss the lawsuit. Activists in Portland, Oregon gathered at the final public hearing on the regional power plan held by Northwest Power and Conservation Council in mid-October, 2009 to voice their concerns about the future of carbon emissions in the Northwest. NW Energy Coalition and the Sierra Club's Beyond Coal Campaign, among others, brought citizens out to testify. The coalition's goal is to insert language in the regional power plan that puts a price on carbon emissions, making it expensive to pollute. The plan is set to be finalized by early next year. It was announced in January 2010 that the popular social networking site Facebook would build its first data center in the eastern Oregon town of Prineville. The cost of the 147,000 square foot facility will cost approximately $200 million. It will be the first data center Facebook has built. The plant would provide jobs to the economically depressed town. However, critics claim that the plant's need for electricity will be substantial, pointing out that Prineville's utility company PacifiCorp generates the majority of its power by coal-firing. "Facebook, by opening this center, is sending a signal: We're not quite done with coal yet," said Daniel Kessler of Greenpeace of Facebook's decision. "We understand that the data center is being built. They already have a power service agreement. This is really about where Facebook and the industry are going." A Facebook group titled "Get Facebook off Coal" has drawn over 8,000 thousands of members as of late February 2010. Another group by the name of "We want Facebook to use 100% renewable energy" has also accumulated over 12,000 members as of February 25, 2010. Campaigners that oppose Facebook's decision to build a plant hope that pressure from Facebook users could force the company to reconsider its decision to power the facility by burning coal. "It is simply untrue to say that we chose coal as a source of power ... Every data center plugs into the grid offered by their utility or power provider" Facebook has responded. "In selecting Oregon, we chose a region that offers a uniquely dry and temperate climate. Greepeace put additional pressure on Facebook is September 2010 by releasing a video that targeted Facebook founder and CEO Mark Zuckerberg. The cartoon video, voiced by what sounds like a computerized child, first attacked Zuckerberg for being a nerd, a la "The Social Network" trailer, before criticizing its choice of power for the Prineville, Ore. data center. Facebook had the option to choose wind power, but "silly Mark Zuckerberg chose dirty old coal," according to the Greenpeace video. "But Mark Zuckerberg can still change his mind, and I know which one I would choose, and so do all his friends," the video continued. In September 2010, Facebook founder and CEO Mark Zuckerberg reacted to a question posed by a Facebook member named Evan to this issue by stating that "Some of our old data centers we rent use coal but most are already green. The newer ones we are building from scratch in Oregon use hydro power from dams. We're moving in the right direction here." Greenpeace said in February 2010 that about 83 percent of the utility's generation capabilities come from coal, geothermal, and natural gas resources. Facebook states that that number is actually 58 percent. In November 2010 Facebook launched a page on its social networking site titled, "Green on Facebook". The page outlines what the company is doing to be "environmentally friendly". Forbes.com noted that Facebook likely launched the campaign to counter the pressure from Greenpeace and others for its proposed Oregon data center that will use coal energy to power its servers. Greenpeace in March 2011 began airing an ad campaign in California which called for Facebook to "unfriend coal". The environmental group hoped the ad will reach many of the company's employees located in Silicon Valley. In April 2011, Facebook released a report detailing the specs for its computer data center to be built in eastern Oregon. In the publication, called the Open Compute Project, Facebook published everything from the server specification and rack design to the configuration of its power infrastructure and cooling systems. However, Greenpeace responded that while efficiency and transparency were important, that Facbeook ought to also look to a cleaner energy source and that efficiency alone was not enough. It was announced in April 2011 that Facbeook would install a large solar array in Prineville, Oregon making the company one of only a handful of data centers in the world to install on-site solar power generation. The solar array is reported to be able to generate about 100 kilowatts of energy, with a total expected production of 204,000 kilowatt hours a year. This amount is only a small fraction of the power required to run a major data center and will primarily be used to support office areas rather than server rooms. Facebook’s solar installation garnered praise from Greenpeace, which stated that this was an "encouraging" sign for the company. In December 2011 it was announced that Greenpeace was dropping its campaign against Facebook. The company and environmental organization announced that they will work together to encourage the use of renewable energy instead of coal. No demands by Greenpeace toward Facebook were reported in the announcement. On Halloween 2011 in Portland, Oregon a man dressed as a zombie was arrested during a protest by members of Portland's Rising Tide at a downtown Bank of America. The activists, calling themselves "zombie army against coal" were protesting the bank's loans to coal companies. On March 17, 2012, Washougal City Council voted 7-0 to pass a resolution requesting that Washougal be a “party of record” for the Gateway Pacific Terminal Project in Whatcom county and the Millennium Project in Cowlitz county. The resolution requested that impacts along the rail line through Washougal be included in the Environmental Impact Statement (EIS), and also urged the State Department of Ecology, the Army Cops of Engineers, as well as both Whatcom and Cowlitz counties, to conduct an EIS scoping hearing for each project in a Clark County location. Coal Rally Against Exporting Coal Through Pacific Northwest. The Oregon Department of Energy is reviewing a permit application to revive an existing coal-burning plant in Nyssa, Oregon, that had been used to process sugar beets. The current proposal is to restart the coal-burning plant to make ethanol from corn or sugar beets. See http://is.gd/eCvE for information on the permit application. This one plant represents 10.0% of the state's total CO2 emissions, and 17.3% of its total SO2 emissions. However, according to the Oregon Department of Energy's 2007-2009 Energy Plan (accessible here: http://is.gd/eCB1, pdf), coal provides 41% of Oregon's electrical power supply, just behind hydropower (at 42%). A study released in July 2010 by the Civil Society Institute argued that it was technically and economically viable to retire all coal and nuclear based power in seven Western states, including Oregon. Bishop stated the arrival of one coal train per day would create 100 ship calls per year. However, coal exports would bring too many ships for the cargo terminal to handle, stated Bishop. "If any coal terminal is developed in Coos Bay, it would have to be a stand-alone terminal." It was announced in October 2011 the Port of Coos Bay signed an exclusive negotiating agreement with an unnamed company interested in shipping coal from Coos Bay, Oregon. In August 2012 Democratic Rep. Peter DeFazio said he has few qualms about shipping coal to Asia through the Port of Coos Bay. Rep. Peter DeFazio said that trying to block plans to ship coal to Asia won't stop countries like South Korea from burning coal to produce electricity. He added that free trade agreements make it illegal for the U.S. to block coal exports to South Korea. There are no coal mines in Oregon. ↑ Oregon Sierra Club's Beyond Coal Campaign, Sierra Club, accessed March 23, 2010. ↑ "Where Does Oregon Get Its Coal?" Sierra Club, accessed March 23, 2010. ↑ 5.0 5.1 Oregon Energy Consumption Information, eRedux website, accessed June 2008. ↑ 6.0 6.1 Coal Production and Number of Mines by State and Mine Type, Energy Information Administration, accessed June 2008. ↑ "PGE plan suggests shorter time frame to close Boardman coal-fired power plant", Ted Sickinger, The Oregonian, January 14, 2010. ↑ Demonstrated Reserve Base and Estimated Recoverable Reserves, Energy Information Administration, 1997. ↑ Judge rejects Portland General Electric argument in coal plan pollution case, OregonLive.com, accessed October 6, 2009. ↑ Portland city leaders oppose PGE's future power plan, OregonLive.com, accessed October 6, 2009. ↑ "Activists push for cleaner Northwest energy", SeattlePi.com, accessed October 19, 2009. (This is an Associated Press article). ↑ "A Facebook message from Mark Zuckerberg" Laura K, Greenpeace Blog, September 29, 2010. ↑ "Echols of West Memphis 3 talks about appeal, death row" Chloe Albanesius, PCMag.com, September 17, 2010. ↑ "Facebook ‘friends’ the green movement" Mother Nature Network, Forbes.com, November 10, 2010. ↑ "Greenpeace Continues to Target Facebook in its New "Unfriend Coal" Ad" Nicole Henderson, Web Host Industry Review, March 30, 2011. ↑ "Facebook publishes specs for efficient data centre" Information Age, April 8, 2011. ↑ "Greenpeace: Facebook’s Solar Use ‘Encouraging’" Rich Miller, Data Knowledge Center, April 18, 2011. ↑ "Facebook, Greenpeace in Truce Over Data Centers" Associated Press, December 16, 2011. ↑ "Portland police arrest protester dressed as zombie" KPTV.com, November 1, 2011. ↑ "Increased Coal Train traffic spurs resolution by Washougal City Council" Martha Martin, Silver Star Reporter, March 18, 2012. ↑ 45.0 45.1 "Bulk cargo terminal planned in Washington state" Seattle Times, March 1, 2011. ↑ 47.0 47.1 "Port of St. Helens potential candidate for coal export to Asia" Scott Learn, The Oregonian, June 15, 2011. ↑ "Port enters negotiations with coal shipper" Gail Elber, The World, October 21, 2011. 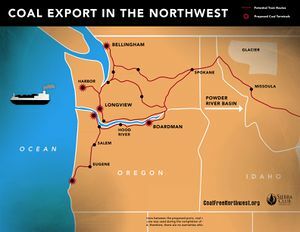 ↑ [http://www.oregonlive.com/environment/index.ssf/2012/08/shipping_coal_to_asia_from_coo.html "Shipping coal to Asia from Coos Bay sounds good to Peter DeFazio" Associated Press, August 17, 2012. ↑ "Boardman coal-burning power plant may have a future after all: biomass" Matthew Preusch, OregonLive.com, accessed February 1, 2010. ↑ 61.0 61.1 "DEQ proposes new options for shutdown of PGE coal plant" Ted Sickinger, The Oregonian, June 28, 2010. This page was last edited on 13 March 2015, at 18:31.